Sometimes, I get burned out on cooking. To the point of “y’all are on your own tonight, Mama is done!” I open the fridge door, and stare at the contents, willing something to jump out at me and when nothing does, I think I need to go shopping. For food, anyways 🙂 Does this happen to you? Here’s a solution to help make you the hero of the kitchen once again! 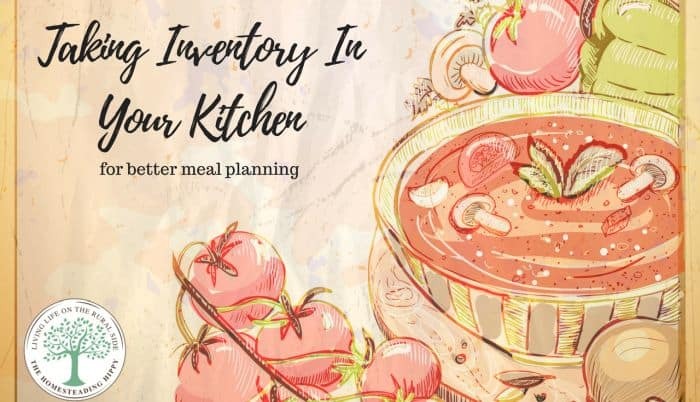 Today, we are going to talk about taking inventory in your kitchen. How do you make a good meal with wholesome ingredients when you don’t know what you have? Or, do you find that when those carrots are hiding at the bottom of the fridge, they go bad before they are used? When you are constantly shopping for new ingredients, it’s hard to save money. For many of us, a trip to the grocery store is not just for one item. Since you had to drive there, why not pick up this or that, and “wow! What a great sale on ____! I need 3 of them.” Spending money like that adds up. I had this issue one night, and decided to take control. Here’s what my fridge looked like when I stared into it and thought I had nothing to make for dinner or other meals for the week. I actually started making out a grocery list, until I really looked at what was in the fridge already. Of course, none of those items would make a meal, right? Not by themselves, anyway. As you can see, we didn’t go hungry that week. Sometimes, you just need to go back to the basics. 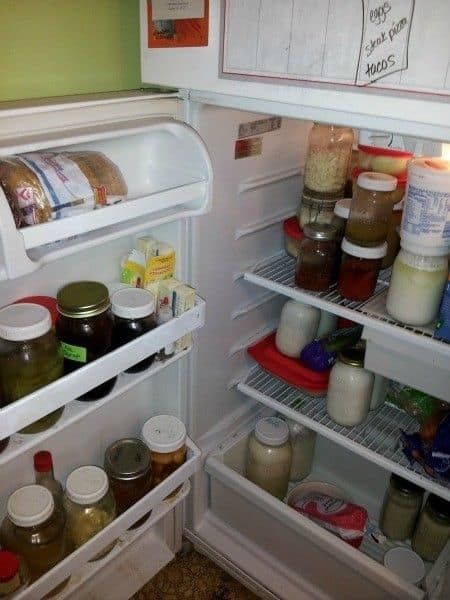 That means stepping back and cleaning out the fridge a bit and re-arranging the items so you can see what you have. It can also be trying something new and pushing your creative limits. Start by taking an inventory of what you have in your pantry, fridge, and freezer. Do this at least twice a month to insure that you are using all the food up, and not wasting any. Yes, spoiled food can go to the compost, but who likes to grocery shop for the chickens. Read more about that here. Once you have your inventory list, decide what you family likes to eat. Fill in the most obvious meals first..yogurt for breakfast, veggies with hummus, salad…then move on to what you have in the pantry to make more options. Think outside the normal-flour for pizza dough or pasta, making tortillas for enchiladas or tacos, rice for a side dish. Need a great recipe for making homemade pasta? Full video instructions included, too! Don’t forget to include your freezer in this. Do you have some meat lurking behind the ice cream that you can use? How about pulling some of the frozen zucchini to make zucchini pancakes or bread for snacks? Hey, isn’t that a pack of stale bread for making breadcrumbs? Once you get the creative juices flowing, there’ll be no stopping you! And, when you can’t get into making food again…there’s always the eggs. Scrambled eggs for dinner, anyone? Do you take inventory in your kitchen? How does that work for you? Be sure to pin this for later! While you are at it, download this FREE pantry printable to help you keep track of your kitchen inventory! If you need more help, read the post here on building your pantry to a par level. I do this periodically, especially when I don’t feel like lugging the toddler to the grocery. I have come up with some creative stuff. I have many times ravaged the fridge and freezer for something to make up meals between now and the next flow of cash into our four-person home. I have plenty of ingredients but no true knowledge on what to make with them. Then I fell back on what I did know: how to research on the Net. I found the best way to find recipes (often unheard of but surprisingly delicious once tweaked to families flavor palate) is to type in the ingredients with each incased in quotation marks and a common separating each. Plenty to choose from and no need to try to rack one’s brain to remember a dish’s name from that family reunion from 20 years back.